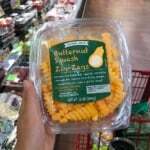 I went to Trader Joe’s yesterday around 4pm and literally almost went insane. First of all, never go to Trader Joe’s between the hours of 3-5:30pm. Trust me guys, your car will most likely be hit by red shopping carts (happened to me), children will run into with mini shopping carts, you will be blinded by a sea of Hawaiian shirts and it will take you a good hour and a half to get a total of 10 things. After that you may hear that bell they clink at the check out lane ringing in your ears for a good 5 hours after. You may even have dreams about it (also happened to me). Yep. Sometimes I’m just that basic girl. BOTTOM LINE: It’s delicious and super good for you (lots of vitamin A, C and fiber). Get with it. I don’t know where I got the idea to put yogurt in the squash but I figure sour cream is good on potatoes and squash is similar to potatoes so why not try greek yogurt? I call this the holy grail of all breakfasts. 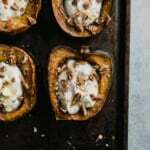 The warm cinnamon sweet acorn squash paired with creamy cool greek yogurt, a drizzle of honey and some crunchy pecans is simply sensational. Best breakfast I’ve had in quite sometime! I hope you give it a try. Sometimes I eat it for dinner after a long run. Mmmmm you can’t go wrong. xo! 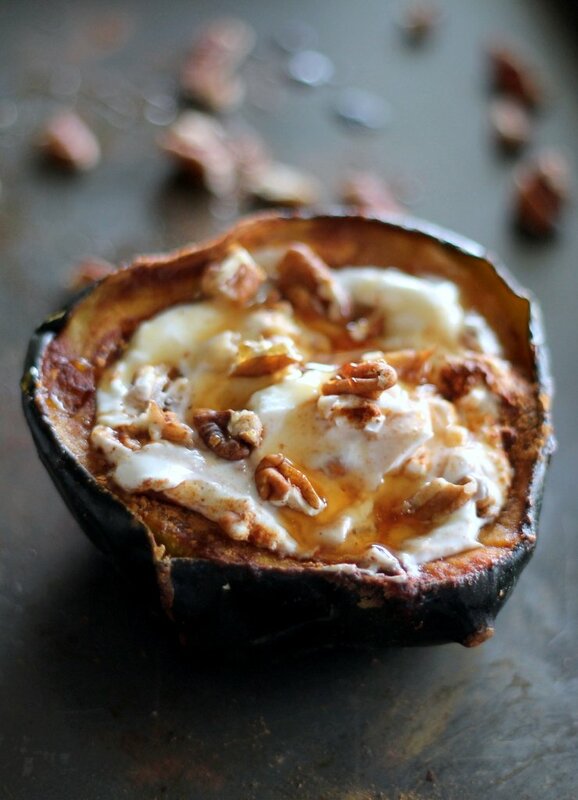 Baked Acorn Squash served with greek yogurt, a drizzle of honey and a few pecans. A new breakfast favorite! Cut acorn squash in half lengthwise and scrape out seeds. Place halves facing up on foil-lined baking sheet. In a small bowl, mix together coconut oil and cinnamon. 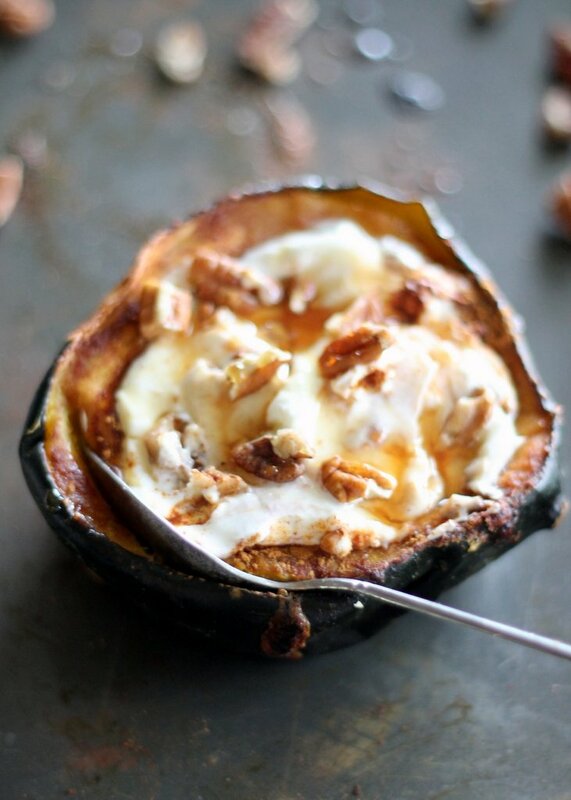 Use your fingers to rub each half of the flesh of the acorn squash with the coconut oil and cinnamon mixture. Place 1 teaspoon of brown sugar in the middle of each half and rub into the squash. 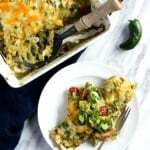 Bake for 45 min-1 hour or until squash is fork tender. 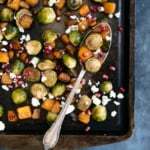 Once squash is done, allow to cool for 5-10 minutes then place on plates or put in tubberwear if you are planning to enjoy this later. 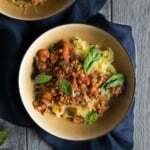 When ready to serve, make sure squash is warm then scoop 1/2 cup yogurt into each squash half. 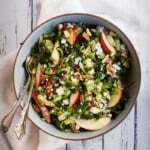 Drizzle each with a teaspoon of honey and pecans. Serves 2. Enjoy! You can use vanilla greek yogurt or even plain yogurt. If you are vegan or dairy free, try using an almond, soy or coconut yogurt. The squash is even wonderful without yogurt! Feel free to use maple syrup instead of honey and walnuts or almonds instead of pecans! 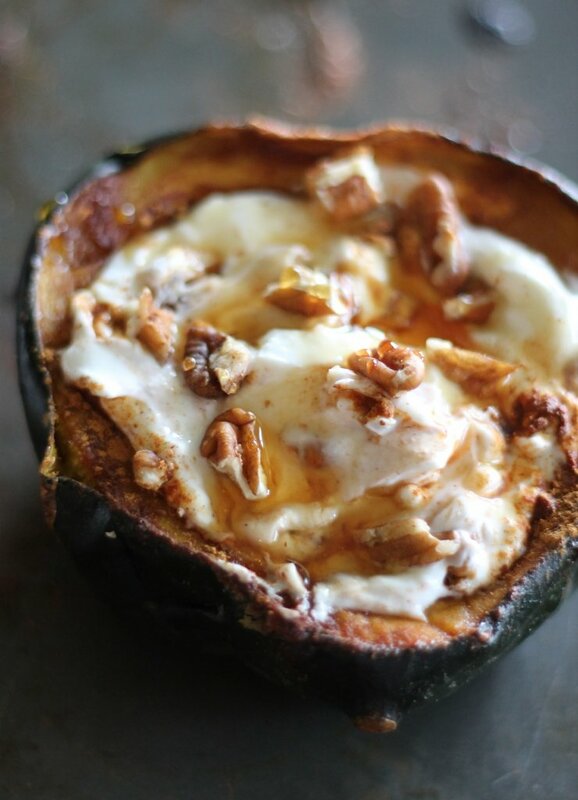 39 Responses to "Breakfast Baked Acorn Squash with Greek Yogurt, Honey & Pecans"
Love acorn squash. Sweet potatoes, thats exactly the flavor. I stuffed mine like a stuffed pepper the other week – so yummy 🙂 The sweetness is intense and the squash is just so soft. YUM! This breakfast looks AMAZING! Love the honey and pecan pairing! Thanks for sharing. Absolutely loving this squash! I put yogurt on baked sweet potatoes for breakfast all the time and people always think I’m kind of weird. But it’s so good! Can’t wait to try it with acorn squash! Oh my goodness, this looks so delicious! 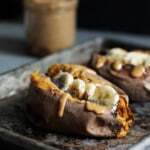 I absolutely love acorn/anykindofwinter squash! Seriously, I recently made a “five fall favorites” list on my blog and the #1 thing was squash. Yep, I’m that bad. I could literally eat it for breakfast, lunch and dinner. Oh, I wish I could be run over by small children and mini shopping carts! You’re so lucky to live near a Trader Joe’s – the closest one is 2 hours away from us. waa. I want this for dinner now. Pinning! Ugh I know! The world needs more squash! I love this combo! I never thought about eating this type of thing for breakfast but now I will try it! 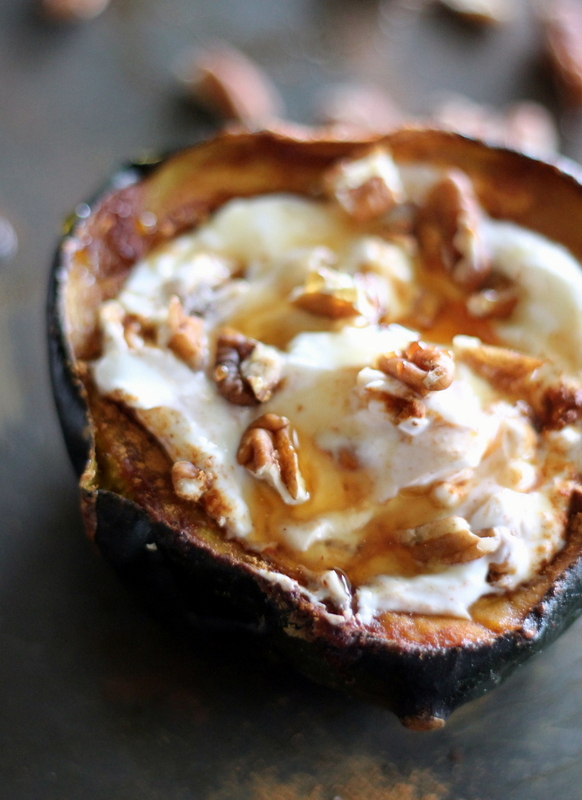 Do you think the roasted acorn squash would hold up to make ahead and microwave in the morning? Squash for breakfast?! You are QUEEN. Love this! I make acorn squash the way my mama did. I roast it with apples, cinnamon and butter inside. Yum! What a great idea to make it for breakfast. Woodbury tjs is far less insane. Do you shop at the Minneapolis store? “Sometimes I’m just that basic girl.” I’m in tears laughing. Giiirl, you anything but basic. Love this creative breakfast idea! This is seriously off the hook! Haha thanks Liz! I know you’d love it! Just tried this… and LOVE IT!! Many thanks! Oh my goodness, you’ve got a new follower based off this recipe alone! We had this for breakfast after our work out this morning, skipped the brown sugar and used vanilla Greek yogurt and it was amazing!!! Husband even asked for it to be on the repeat list. Win! My second time to make it but I am serving it as a light dessert! I did use Greek yogurt from whole milk though. Cabot is by far my favorite for its smooth flavor. Just made this today. I had to modify slightly with olive oil instead of coconut, but used coconut sugar instead of brown, and only had almonds and honey vanilla yogurt on hand. However it’s still delicious. Too sweet for my father in law though. He’s not a fan of sweet in the morning. Now determined to make a more savory version… maybe butter and plain yogurt more like one would have at dinner. I think the best things is being two halves.. I can do one sweet & and one not! 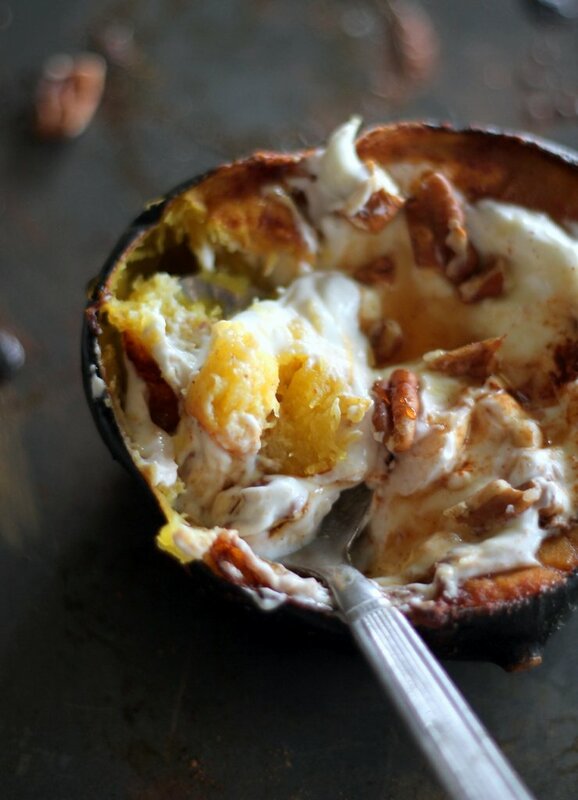 I never had acorn squash before, made it this a.m., and it’s so good! I sprinkled some pomegrantes on mine. Perfect breakfast! Pomegranates sound delicious.